"The staff is extremely friendly with smiling faces. You're in and out quick." "Great service—always happy and attentive! I won't go anywhere else." "The most amazing staff in town, always happy and friendly. My go to place." Leaders in diagnostic imaging, the experienced and knowledgeable team at Tri-City Radiology in Kennewick, Washington, continues the tradition of excellence in radiology that began in 1971. The American Board of Radiology certified the entire Tri-City Radiology medical team of James A. Clark II, MD; Lon Welch, MD; Steven Sunderland, MD; and Garry Dunn, MD. Having the newest 3T MR scanner in the tri-cities, Tri-City Radiology remains at the forefront of the rapidly changing advanced technologies of diagnostic imaging. Patients in Kennewick and the surrounding communities who choose Tri-City Radiology experience state-of-the-art radiology equipment and physicians who are committed to the highest standards of patient care. A highly qualified team of technologists performs the diagnostic imaging tests under the supervision of the team of doctors. The technologists have college degrees and certifications in their specific areas of expertise in radiological technology. Each doctor and technologist at Tri-City Radiology strives to provide a comprehensive and comfortable experience for patients of all ages. The office is conveniently located with front-door parking, a simple check-in procedure, and same-day results if necessary. They also offer easy scheduling, on-time exams, add-ons, and help with insurance claims. 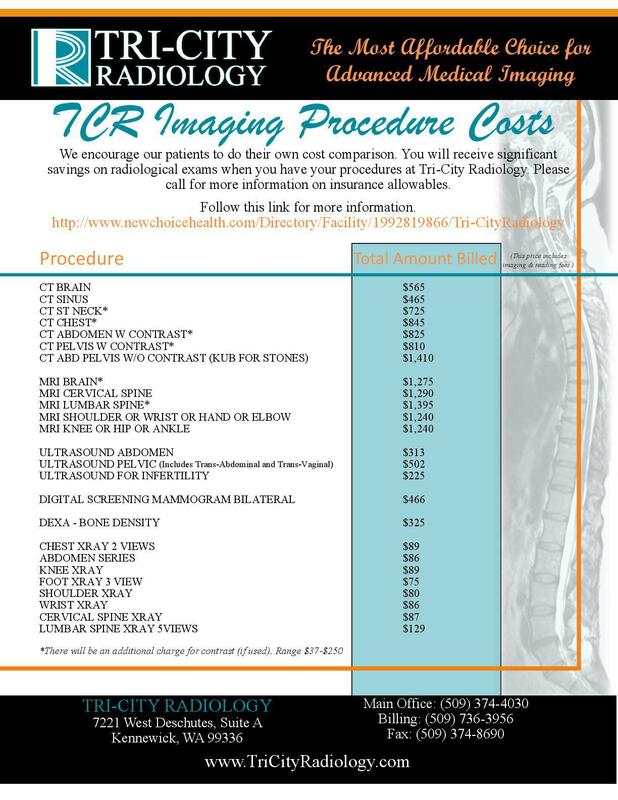 Their services include MRIs, CT scans, ultrasounds, and fluoroscopy, among others. The doctors and technologists are happy to answer questions regarding diagnostic exams, and they promptly forward test results to the appropriate physicians' offices so they can discuss the results and establish any necessary treatment plans. "They got me in the same day and at a much lower price than other facilities in the area. I even had the results the next day!" "Always great service when I walk into the main entrance and the women’s center! Everyone is so helpful and has a great attitude." "The techs are always friendly. The billing department worked with my husband and I on our balance. This is only place we'll go to for diagnostic imaging!"